The 2019-2020 International Mentoring Association's Hope Richardson Dissertation Award recipient is Dr. Laura Johnson-Hurcula. The award was bestowed upon Dr. Hercula during the International Mentoring Association's Conference from March 11-12, 2019 in Gainesville, FL. Every two years the International Mentoring Association recognizes outstanding research in the field of mentoring. This is the association's preeminent research award and recognizes innovative and exceptional contributions to the field of mentoring. This award, presented to the person who has submitted the best doctoral dissertation, is given to foster and disseminate research in the practice of workplace learning and performance. Dr. Laura Johnson-Hercula Recently completed her doctoral studies in Educational Leadership and Administration from the University of North Carolina Wilmington (2018). Dr. Hercula also holds a BA in Economics from Whitman College (1996) and MA in Mathematics from the University of West Florida (2003). She is currently a mathematics instructor and lead mentor for a faculty mentoring program at Coastal Carolina Community College in Jacksonville, North Carolina. Her experiences as lead faculty mentor became the inspiration for her dissertation and provided an opportunity for her to explore the impact that serving as a mentor has on faculty classroom instruction. Association, Dr. Nancy Phenis-Bourke. 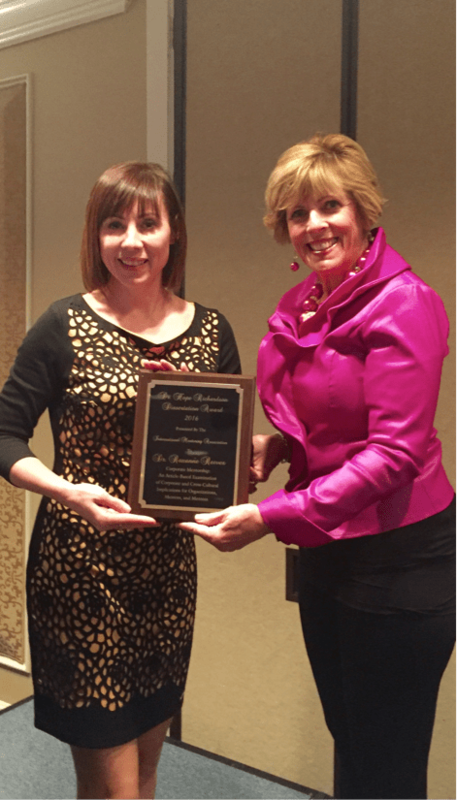 The 2014-2016 International Mentoring Association's Hope Richardson Dissertation Award recipient is University of New Brunswick Alumna, Dr. Roxanne Reeves. The award was bestowed upon Dr. Reeves during the International Mentoring Association's Conference from April 13-15, 2016 in Auburn, Alabama. Dr. Reeves' dissertation entitled, "Corporate Mentorship: An Article-Based Examination of Corporate and Cross-Cultural Implications for Organizations, Mentors, and Mentees is recognized for its research, scope, its three stand-alone manuscripts on corporate mentorship, cross-cultural mentorship, and mentorship competencies. "She was selected for this award due to the power and significance of her work and research" says acclaimed author and President of the International Mentoring Association, Dr. Nancy Phenis-Bourke. Phenis-Bourke stated "Dr. Reeves was recognized for the strength of her research and work on both cross-cultural mentoring for newcomer immigrant entrepreneurs and also for work on investigating best practices for high potential employees within the corporate sector." Reeves stated "I am most thankful for the recognition this award presents. It is professionally and personally gratifying especially since it also acknowledges how well we mentor others in New Brunswick." In an interview, Dr. Reeves stated that her early experience as a recipient of mentoring at home in New Brunswick and while living overseas led to her academic investigations. For Reeves, "mentored learning, real-life experiential learning, and building robust relationships have been equally and sometimes more valuable than classroom learning. In fact, most all of my successes worth celebrating are victories hard earned and achieved due to the support of mentors. I marvel at how my mentors raised the bar for me, modeled the way, pushed me beyond my personal limits, encouraged me to enlarge my thinking, and believed in me- they saw in me what I couldn't." "My expectation is that my research findings will help organizations with future workforce requirements by assisting in efforts to find, train, and retain the best possible people. With Canada's current plan to continue welcoming immigrants, I believe one of the most important pieces of research is considering cross-cultural mentorship as it pertains to newcomer immigrants." It is currently estimated that more than three million students are studying outside their home country. This represented an increase of 50% over statistics from 2000.